I was a junior in college when the reality of today’s economic and social injustice hit me squarely in the gut with soul crushing force. After managing through my own set of difficult circumstances — escaping the cycle of poverty and dysfunction that included abandonment by my mother, gang-involvement, a stint on juvenile parole, a teenage abortion and becoming a high school drop-out — I was working several jobs to get myself through school at the University of Southern California. One of those jobs was assessing kids involved in a long-term study on the impact of early learning on brain development. As a research assistant I would go to the kids’ homes and periodically assess their progress. Many of our participants lived in neighboring South Central Los Angeles where poverty, violence and drugs were rampant, but given my own experience growing up in similar conditions, that type of environment didn’t shock my senses very much. I arrived at my assigned child’s house one day and began my normal routine of introducing myself to the parent and figuring out where in the home was best to do the assessment. I was used to working just about anywhere given that most homes I went to were tiny and cramped and generally didn’t have a lot of room to work with, but on this occasion I noticed right off the bat that this was going to be different. As soon as I walked into the tiny one-bedroom, single-story apartment, I looked around and saw things everywhere — dirty clothes, dishes, shoes, plastic and paper bags, and what seemed like countless other things — on just about every surface imaginable. There literally was not a single space to clear off or rearrange and the house smelled like it hadn’t been exposed to fresh air in weeks, so I decided to work with the child on the apartment stoop. The child was about 5 years old — a young black boy who even despite his living conditions had a smile on his face and a twinkle in his eye. I made my way through my standard questions — “How often do you read?” “Sometimes, when I’m in school.” “How often does your mom read with you?” “Never.” “Do you enjoy reading?” “Yes.” “How much? On a scale of sad face to happy face, point to the face that shows how much you enjoy reading.” He pointed to happy face. So on and so forth. When we got to the end, I told him he did great and began to put away my things. And then it struck me: this bright kid, this happy, starry-eyed kid, this kid with all the potential in the world, had nothing. He had a filthy, dirty apartment with no active parenting, no role models around, and I was about to make his week just by giving him my happy face sheet. So I said, “Well of course you can have my sheet!” Then I started to furiously dig around my bag to see what else I could find. I found some neon highlighters he could color with, a few extra happy face sheets, and some red and blue pens. I gave it all to him. Then I said, “Ok, I have to go now. Have fun coloring your sheets. And remember to read at school every chance you get!” He happily nodded as he walked back into his filthy apartment. I walked to the sidewalk, sat on the curb, and sobbed uncontrollably. I sobbed with despair I hadn’t felt, well, ever. I knew as soon as I walked away what was likely in store for that kid — I knew the odds were against him, just like they were against me. I knew that statistically-speaking, he was likelier to end up in prison or dead than end up attending college. I knew that I had just witnessed the human tragedy that is wasted potential. And I knew I was powerless to do anything about it. Until I realized that I wasn’t. Until I realized that change is achieved one person at a time, one day at a time, and one vote at a time. I think about this boy all the time. I wonder if he beat the odds. I wonder where he is. I wonder if he’s still alive. He still makes my heart hurt. I thought about him when I first heard Bernie Sanders speak. Choosing which candidate to support for president was one of the most difficult tasks I have done in the recent past. I’ve always been strong in my resolve, firmly planted in my roots and guided by my sense of justice. I have never made a political decision based on what was the “smart” or “safe” thing to do (just ask any of my often times dismayed political advisors) and I have always done what I believed aligned with my values and my ideals. But this decision was difficult because both Bernie Sanders and Hillary Clinton are both accomplished and worthy candidates, and both are light years ahead of any of the Republican choices. And as the first Latina elected to the Nevada legislature in the history of the state, and as a young woman who has struggled mightily in this male-dominated world of politics, Hillary inspires a lot of pride. But only one of these candidates makes me think of that young boy in South Central Los Angeles — and that’s Bernie Sanders. We used to live in a country where the “American Dream” was attainable for most. We used to live in a country where you could make it if you tried, where upward mobility was a tangible thing, and where education was the key to success. But that’s not the America we live in anymore. Fewer and fewer Americans are able to break the cycle of poverty, wages are stagnant or declining for most except for the top 1%, and our political system is dominated by millionaires and billionaires. Secure retirements and pensions are becoming a thing of the past, and that key to success via education is instead becoming a weight of massive debt hanging around the necks of young people everywhere, myself included. How did we end up in a country where you can break the cycle of poverty only to end up in a cycle of debt? I believe that Bernie Sanders wakes up every day with these things on his mind. That the unfairness of it all weighs on his heart, just like it does mine, and that when he is elected, he will do whatever it takes to make America the land of opportunity again. I believe that Bernie Sanders will lead the charge, with many millions of Americans behind him, against the unfettered Wall Street greed that has threatened the very existence of the middle class and shackled so many more to permanent poverty. 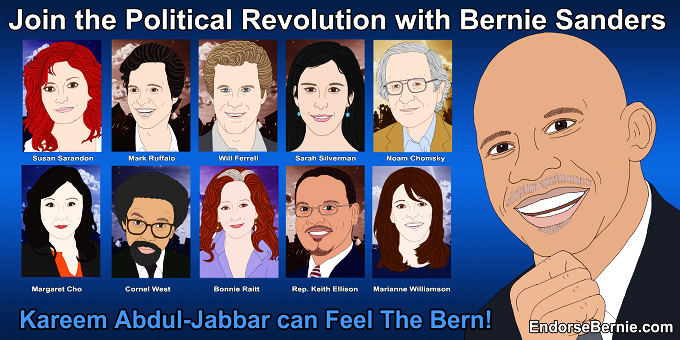 I believe that now, more than ever, America needs a political revolution. 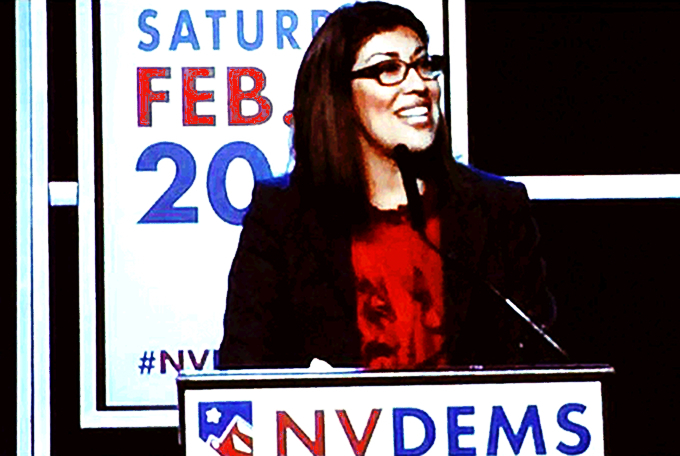 Lucy Flores, the first Latina to serve in the Nevada legislature, is running for Congress in that state’s Fourth Congressional District.